I grew up in Fort St. John and attended school here. I remember being one of the first students to walk through the doors of the brand new C.M Finch Elementary the year it opened. I played minor hockey as well as a variety of school sports. And I got my first job here, working at the Co-op Grocery Store. After I graduated from North Peace Secondary School, I went away to college. Although my career took me away from the community for several years, I was excited to move back home to Fort St. John with my wife and family in 1998. And from the day we moved back, we knew we were right where we belong! I have always enjoyed planning out my life and believe it is important to set a course and see it through. This started at a young age, when I was just 10 years old, and I informed my friend, Sharon, that someday we would be married! Sure enough, 10 years later, after much determination, she finally agreed to marry me, and we have been married for over 36 years now. We have so much fun together, and she is my best friend! I believe that wherever we are, we need to do all we can to be involved and contribute to the good of the community. And so, when we moved back to Fort St. John, one of the first things I did was to look for opportunities to get involved. Our 3 children grew up in Fort St. John and attended the public schools here. All three have graduated now, but when they were attending school, I volunteered as much as possible, helping in their classrooms, accompanying their classes on field trips, coaching sports teams, and serving on their Parent Advisory Councils. In fact, I served for several years as the President of the North Peace Secondary School Parent Advisory Council. I worked for several years as support staff for School District #60, in many of our schools; Elementary, Junior High, and Senior High. I enjoyed getting to know staff and students, and began to understand and appreciate our School District more and more! My time as an employee of SD #60 came to an end in 2005, when I was elected as a Trustee on the School District #60 (Peace River North) Board of Education. During my 6 years on our Board of Education, I have served as Vice Chair of the Board, Operations Chair, and Personnel Chair. I also served as our Board Representative to the BC Public School Employers Association. As I talk with people in our District and throughout the province, I am reminded that we do indeed have one of the best School Districts in the province of BC! We can be very proud of the innovation and creativity in how we deliver education. We are doing things in our School District that other Districts haven't even dreamed of yet! We can be confident in the fact that we have some of the best trained, best equipped teachers and support staff who, themselves, are committed to life-long learning. And we can be assured that they care very much for each and every student, and want to see each one succeed in education and in life. It was my privilege to serve as Chaplain to the Fort St. John Fire Department for over 7 years. During that time. I also served as an Auxiliary Fire Fighter. As I have worked alongside all of our emergency services personnel, I have seen, first-hand, the value of having strong protective services within our community. I am so proud of all those who devote their lives to serve and protect our community, and I am equally appreciative of the families who are at home supporting these brave men and women. For more than 10 years I acted as the Northeast Regional Coordinator for the Samaritan's Purse Operation Christmas Child, an annual program that sees individuals, families, businesses, and organizations from our community and across the country pack shoe boxes full of toys, crayons, books, clothes, and hygiene items, which are sent to children all over the world who are innocent victims of war, disease, and famine. 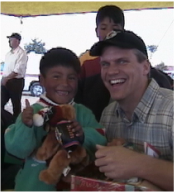 I watched as children in Fort St. John experience the joy of giving, and have been fortunate enough to travel to hand out the boxes, and have seen the happiness in the eyes of children who are so amazed and thankful that someone from the other side of the world, who they do not know, would care enough to send them a gift. It is so humbling! This experience has opened my eyes to the needs in our community as well, and I believe that we need to care for those in need here in our city, not only in a benevolent way, but in teaching, training, and equipping people to be all they can be. Early on in my time here, I was asked to be Chair of the Fort St John Hospital Ethics Committee. This was both a tremendous honour and a huge challenge for me as I walked on unfamiliar ground. I was happy to work with a great team and really learned to appreciate the value of a good health care system. Maybe it's because I'm getting older that I sense that need more and more each day, but I do believe that we must continue to strive toward a higher level of health care in our community. We need to work to attract doctors and nurses and specialists, and begin to look for ways of training up our own youth in the field of medicine right here in our community, and do whatever we can to keep them here after they have completed their education requirements. A few years ago the city formed a Focus Group to address "Anti-Social Behaviour" in our community. I participated in those discussions and I believe it was a good place to start. While I agree that we must address and contend with the anti-social behaviour, we must also do all we can to prevent that behaviour. We do need rules and regulations, and we certainly need to expedite the court process, strengthen the penalties and accountability, support our police, and reduce the barriers they face as they combat crime. At the same time, we need to work with community partners to teach, model, and encourage people of all ages to be socially responsible citizens who care for each other, the community, and the world. I believe that strategies such as the Restorative Justice program and the emphasis our School District has made on Social Responsibility are making a difference in addressing the social fabric of our community. I am excited to serve on our FSJ City Council. I want to continue to do all I can to make this community a better place to live, work, and play!